Accept Hervé Tullet's invitation to mix it up in a dazzling adventure of color and tones. Follow the artist's simple instructions, and suddenly colors appear . . . mix . . . splatter . . . and vanish in a vivid world powered only by the reader's imagination. Tullet sets readers on an extraordinary journey of color, motion, and interactivity without ever relying on the bells and whistles of technology. 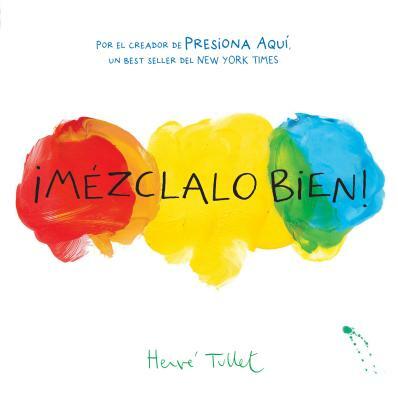 This Spanish-language edition joins Presiona Aquí (Press Here) in bringing Tullet's whimsy and wonder to an ever-widening audience. Hervé Tullet is known as "The Prince of Preschool." A former ad agency art director and magazine illustrator, he is the creator of dozens of children's books, including Press Here, Mix It Up!, and Let's Play!. He hails from Paris, but currently lives in New York City.